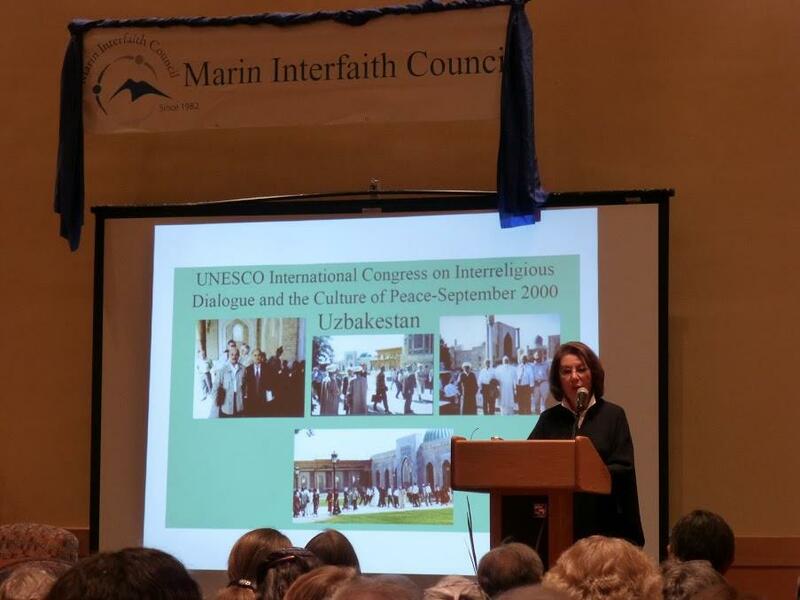 Marin Interfaith Council has been offering monthly interfaith contemplative services for peace. The October gathering, at Sausalito Presbyterian Church, was to feature Pagan religions (specifically "Wiccan") in honor of the season of Samhain. I had committed to conducting this hour-long service; however, I was also selected to be a Deputy Inspector at the polls and the mandatory training for that job was scheduled for the same evening. So I asked my friend Gwion Raven, who had helped me at the Thanksgiving Eve service for the homeless (and their supporters) last year, if he would do it. I had planned on two readings, which I suggested he use. He did use them, plus taught some chants that the group did together. In reflecting on his experience, Gwion said, "It really affected me...I had never experienced being recognized as a Pagan and been so warmly welcomed in a Christian church. [Attendees showed] genuine curiosity." I thank Gwion for his work. The following day, when I attended MIC's clergy luncheon, three people, including Paul Mowry, the new pastor at Sausalito Presbyterian, who had been to the contemplative service told me how much they enjoyed it. I was glad to hear that and glad to relay that feedback to Gwion. The topic of discussion at the luncheon, held in the new Hannah Project1 Gallery space at Marin City,2 where we sat amidst an exhibit of photographs and other ephemera called "Architects, Activists, and Avengers: The Black Panther Party 1968, and featuring photographs by Pirkle Jones and his wife and collaborator, Ruth-Marion Baruch, was "The Role of Religious Communities in Movement Making." I shared a table with two friends from Green Gulch Zen Center and Chris Highland, while we listened to three speakers. Sister Colleen McDermott, Ph.D., told us of her study of the Highlander Center in Tennessee. Founded in 1932 during the Great Depression in Tennessee as the Highlander Folk School, it began with programs to help rural women and organized different groups working for social justice and workers' rights. Among its founders and prominent participants were Myles Horton and his wife, née Zilphia Mae Johnson, Jane Wilburn Sapp, and Septima Poinsette Clark. In the '30s and '40s the institute helped organize miners and textile mill workers. In the 1950s Highlander taught desegregation and citizenship workshops with such participants as Dr. Martin Luther King, Jr., Rosa Parks, and Ralph Abernathy, and organized voter registration efforts. The ubiquitous movement song "We Shall Overcome" comes from Highlander, which has always included music and the arts in its programming. SNCC (Student Nonviolent Organizing Committee) has roots at Highlander. During the 1960s and '70s Highlander refocussed on Appalachia, organized protests against toxic dumping, and more recently it has featured LGBT programs, multilingual programs for organizing immigrants (Pueblos de Latinoamerica Justice School), and post-Katrina relief. Sister Colleen pointed out that religious organizations such as churches have the institutional structure that's an important underpinning of efforts at social change. Institutions grant the authority to speak up and engage. Myles Horton's early seminary studies at Union Theological Seminary in New York informed his dedication to organizing for social justice. This is one of my arguments for having Pagans establish institutions such as Cherry Hill Seminary. Glorifies God by its standards of holiness, righteousness, and obedience to His Word. Demonstrates Christ's command to love one another. ... Worship God in spirit and truth recognizing that Jesus is Head of the Church Recognize its interdependence with other members within the body of Christ which [sic] may not be of the same denominational affiliation. ... Fulfills Christ's command to evangelize the world. Third to speak was Pastor Veronica Goines of St. Andrew Presbyterian Church, a "historical multicultural congregation" also in Marin City. I found the speakers demonstrated an inordinate underlying assumption of an Abrahamic religious viewpoint. For instance, the name of Martin Luther King, Jr. was invoked frequently, yet no mention was made of such figures as Malcolm X and others in the Black Muslim movement that also arose from those fertile and changing times. Neither was there acknowledgement of the African diaspora religions that also gained adherents since those transformative years of the '60s and early '70s. I wanted to mention this as I, a polytheist, sat there with my non-deist friends amidst the assumption of monotheism, but I couldn't come up with a constructive way to comment. Having said all this, I will say I enjoyed the program; I learned a lot that I hadn't known before and may never have been exposed to otherwise. The speakers provided insights and provoked further reflections. It was worth every minute. In a busy two weeks for MIC, we concluded with the annual Visionary Marin Awards Ceremony, this year honoring Dr. Nahid Angha. Musicians played while people sampled delicious food prepared by the sisters of Brahma Kumaris and from Green Gulch Farm and elsewhere, and bid on an array of silent auction items as well as buying raffle tickets for several beautiful gift baskets. A slide show of photos of religious activities by the member congregations of MIC demonstrated the rich variety of our membership. I was pleased to see some photos of Pagans dancing round a Maypole that I had taken. Among the many accomplishments that led MIC to give Nahid this year's Visionary Marin award is her founding of the International Association of Sufism and Sufi Women Organization , "an international humanitarian organization promoting universal human rights." We learned more about Nahid from a Q&A session done with the Rev. Charles Gibbs, Executive Director of the United Religions Initiative. Everyone left feeling that their culinary, intellectual, and community appetites had been satisfied. Plus we met our fundraising goal for the year. Kudos to the Rev. Carol Hovis and her assistant, Allison Kirk, and the many volunteers who worked with them to make this event a success. 1. The Hannah Project assists African-American and other low-income students ages 8-22 and their families in efforts to boost academic performance and college graduation rates. 2. Marin City, begun with housing designed by the late Frank Lloyd Wright for the many workers who migrated here during World War II to work on the Liberty ships in the Sausalito shipyards. It is now home to the largest African-American community in the county. Coincidentally, the famed architect's final commission was our Marin County Civic Center. 3. See Your Black Muslim Bakery and murder of journalist Chauncey Bailey.